Super Absorbent - Every bib is made with two layers of fabric to increase absorbency. The front is made of 100% soft organic cotton, and the back layer is a super absorbent polyester fleece. We got rid of the traditional plastic backing so Matimati bibs do not have a crunchy feel and sound to them. Extra Comfortable - The Matimati bib is extra soft unlike other baby bibs that are so stiff that don't lie flat on your baby's chest and always seem to be bunched up in their face. Made with Adjustable Snaps - Each bib is made with 2 nickel-free snaps to provide different sizes as your baby grows (Recommended ages: 3-24 months). 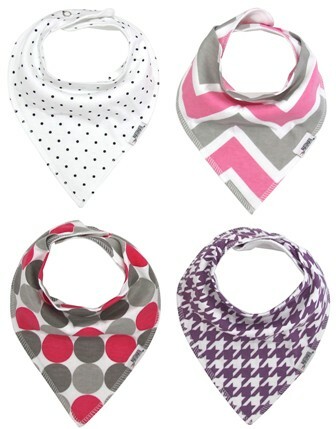 The snaps allow the bib to stay in place making it hard for your baby to easily pull it off. Snaps are also better than velcro as velcro tends to lose its "stick", scratch your baby's delicate skin, and damage other pieces of clothing in the laundry.